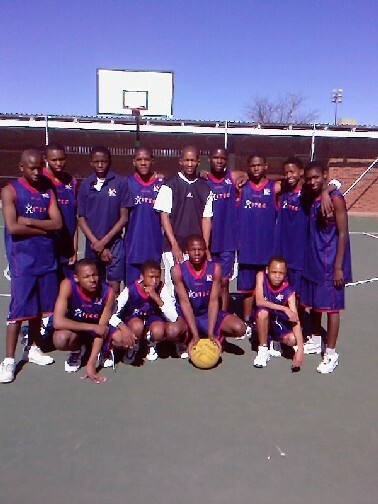 The champions of the 2007 Kovsie Basketball League suffered a shocking defeat at the hands of Khayalami hostel. Whilst the captain of Alumni, Ikaelelo “Bixx” Likhi could not believe his ears about the loss, his counterpart, Ntlantla Mloyeni reluctantly proclaimed the 58 – 57 win to his teammates. Alumni have themselves to blame for the loss. It appeared to be a walk in the park for Alumni when the first quarter ended 20 – 6 in their favour. This did not dampen Khayalami’s determination to play good basketball. Bonginkosi “Sky” Nhlangothi controlled the game well, capturing the mindset of players who began to show signs of frustrations. Khayalami won the second quarter and Alumni reclaimed the third quarter. Thinking they have won the game, Alumni relaxed their efforts and Khayalami added pace in their approach. Khayalami scored 15 baskets unchallenged in the last two and half minutes to win by a point. Tswelopele Hotel gave Dynasty a run for their money in their game. Although they lost the match 36 – 63, Tswelopele showed enthusiasm and a new dimension to the approach of the play. They have bolstered their squad with 5 new players who have settled well in the team. It was the stalwarts who gave the direction for the boys. Mhlanganisi Madlongolwana and Lindelani Madzhie combined well in the new approach of Tswelopele. Nevertheless the experience of Motaki Madimabe on the three point line was to prove to much to handle for Tswelopele. In the other match, Navalsig High School beat Khayalami 36 – 27. Navalsig were quick to realize that they need pace in order to win the game. Having led the game in all three quarters, Khayalami could not keep up with the speed of the youngsters in the last quarter.